Bamboo plants require no pesticides or fertilizers to grow and need little water to sustain, although they do not tolerate completely dry or waterlogged conditions, and if grown in pots bamboo do need more care. Bamboo is popular as an evergreen garden plant and makes fantastic ornamental focal points, specimen plants, privacy screens, hedging, windbreaks, ground cover, and landscape design features in the domestic garden or on a commercial level. With well over a thousand species; there is a vast range of bamboo plants extending from tiny dwarf varieties, to medium and tall bamboo for the garden, right up to gigantic 'timber bamboo' type species. Bamboo plants grow successfully in the northern hemisphere and southern hemisphere, in a range of climatic conditions that includes cool temperate climates and hot tropical places. Although it's a little more complicated than this, the two main different types within bamboo species are basically; running bamboo (Monopodial) and clumping bamboo (Sympodial). It's important that you choose the right type for your garden or landscape project. If you are looking for an ornamental bamboo plant for a focal point in your garden and have a certain area of space to allocate to this as a structural planting, be sure to choose a 'clumping' bamboo. Several clumping bamboos set at certain distances apart will make an equally effective windbreak or hedge but will grow in clumps rather than spread by sending rhizome runners underground. If on the other hand you are planning on planting for a windbreak or privacy screen of bamboo, a running species will fill that up nicely but you will need to put a barrier in place to make sure it only grows where you want it to. Bamboo plants often get a very bad press but this is only due to the wrong type of species being planted in the wrong environment. Running species spread rapidly once established and this causes some despair where these types have been planted in small domestic garden situations and has since got out of control. Gardeners and their neighbours can have a nightmare on their hands if they have planted running bamboo without a rhizome barrier of any kind. There is no need to plant the wrong type of bamboo as there are so many species to choose from and plenty of clumping types that will not dive under your fence into the neighbour's garden! Hopefully you have come to this site to choose bamboo plants not to find out how to get rid of them. However, if you do need to get some sort of control over an existing bamboo plant there are links further down this page that take you to other pages on the subject of controlling bamboo. For hardiness in cold climates choose hardy species that will survive the winters. Clumping bamboo does not send out runners, it stays in a tight clump, grows very slowly in comparison to running bamboo, and therefore makes a better choice for a non-invasive garden plant. The clumping species of bamboos have a different rhizome system to the running species and they grow in a way that looks similar to inverted umbrellas normally producing new shoots yearly. The circumference of a maturing plant will grow bigger each year but by small amounts and very slowly. Even though clumping bamboos do grow in a different way to running species, the clumps do still grow in size and the larger species such as Chusquea gigantea need a significant amount of room as they reach maturity. You therefore you need to choose a planting spot carefully while taking note that bamboo plants of the clumping type need plenty of growing space. Don't plant bamboos too near to fences, walls, or other types of structures to allow a certain amount of annual growth and widening of the diameter of the clump. Clumping bamboos can successfully be grown in containers with the correct care although they do grow better and stay healthier when allowed to grow free in the soil. See my page on container bamboo about caring for bamboo grown in containers. When the rhizome, or root, system is contained and it grows too big for its container, and the plant has not been potted on into a larger container when required, bamboo is a plant that may break your pot eventually. Fargesia and Borinda papyrifera are good in pots. Phyllostachys parvifolia, Phyllostachys edulis, and Phyllostachys vivax are both nice big cold hardy bamboo. Pseudosasa includes some temperate bamboos but others need warmer climates. The rhizomes of running bamboo plants species spread out very quickly, and often aggressively. Running types of bamboo are therefore ideal for creating a windbreak or privacy wall by planting for the purpose of hedging or garden privacy using a screen provided you are prepared to put in a barrier to contain the running species. If putting in a barrier isn't something you can do, or want to do, you can get the same effect by just planting clumping bamboo at distances to suit the size of the chosen species. If you want your screen or windbreak to establish quickly you will need to acquire enough plants and plant them at regular distances apart. Buying one plant and expecting it to grow into a massive dense windbreak in one year will not work, bamboo plants need to be given time to mature and send out running rhizomes. For a high speed screen, buy a few large plants and direct the rhizome growth so they can spread to eventually meet each other and fill the gaps. If you are prepared to wait a few years for your windbreak or hedge to grow you won't need to buy so many plants initially. As your bamboo plants spread, provided you ensure you control their growth in the direction you want them to grow, you will eventually get a good screen. Be warned that it could take a long time though. Depending on the health of the plants, the growing and environmental conditions, bamboos do not always take off immediately and it can take a few seasons for them to establish to maturity. 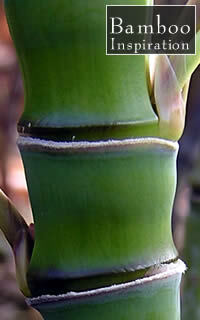 You can propagate bamboo through different methods but by far the best way is by dividing it. Part of the value of growing bamboo plants is the fact that they grow rapidly and are evergreen along with there being some species that will spread aggressively once they are mature by shooting out runners. 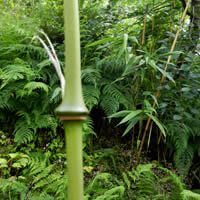 However, care needs to be taken when deciding to buy and plant a running bamboo species due to its invasive behaviour. You can contain bamboo growth rates with various methods such as by installing a strong rhizome barrier and/or regular maintenance to prevent spread. 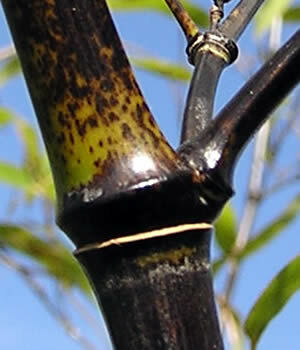 There are methods of bamboo control, including some that involve pruning.